The last four or five years have been a nightmare for many investors, especially those of us investors in the natural resource stocks. Even though gold and silver rallied to new highs in 2011 most shares did not follow and have in fact greatly lagged in performance. Of course during this time there have been some companies that have performed well and were big winners but we know, as well as you, that on balance the natural resource sector has been a nightmare for investors of the shares of juniors and exploration companies. Frankly, that's putting it nicely. Throughout the darkest hours we never lost the vision of our dream. The reasons for us investing in the natural resource shares over the last few years, particularly the gold and silver shares and our position in gold and silver bullion and coins, has never changed. All of the reasons for investing in this sector are even more compelling today than ever: the massive printing of monies by the FED will, we believe, lead to incredible inflation, if not hyperinflation. Now we have Japan to open the printing presses. The entire world is awash in debt with no way out except to print, print and print. This will not end well and ultimately gold and silver will become investor's safe haven during the coming crisis. While it would not have been unusual to experience a pullback in the markets, virtually no one, professional or individual investor, expected what has occurred. The Dark Side of the Dream, our dream and perhaps your dream, of becoming rich in the bull market in the commodity stocks is either over or greatly delayed. So which is it? The markets never play out the same way from one bull market to another. This interruption in the bull market in the natural resource sector will become one of the greatest head fakes of our time. A great shakeout so extreme that many investors have been so badly shaken they may never return to buy shares or long term warrants in the resource sector again. Or will they? Emotions and investing are rarely compatible bedfellows. Strangely, investors, frequently, at the worst of times will sell out their positions because of fear, ignoring all facts, all reason, and will perhaps greatly regret their decisions. These same investors will once again enter the markets but not until they can no longer stand it as the markets are approaching their peaks. The emotions of these same investors will allow them to overstay their welcome and ride the markets down into the depths once again. Most newsletter writers and analysts are suggesting their subscribers to be buying and buying now. However, it seems few investors are listening as they are waiting for something, but what could that be? Fact is, few investors can buy at these current outrageously low prices, they can not be a contrarian and they apparently will wait for higher prices which will be their confirmation to enter the markets. Sure, we can understand there concern but as the professionals preach, to make money, one must "buy low and sell high". This is the time! 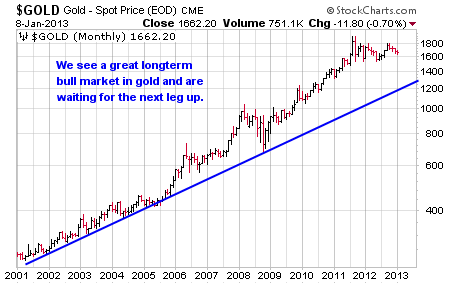 Our view is that gold is in a great long-term bull market from the chart above and is consolidating for the next up leg. 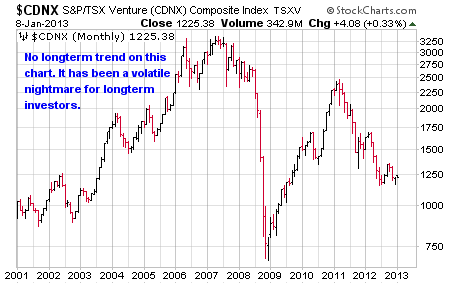 Many of the junior mining companies are listed on the TSX Venture Exchange and you can see above that this has been a nightmare for those long-term investors. 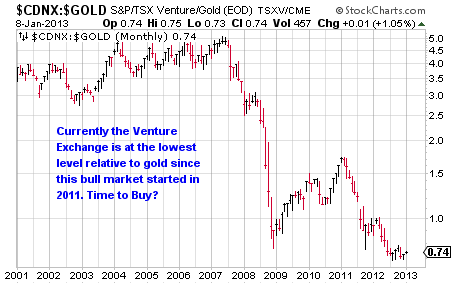 The last chart reflects that the Venture Exchange is now at its lowest level relative to gold since the beginning of the bull market in 2001. Most writers of financial newsletters currently believe, as do we, that the resource shares will eventually erupt into a rip roaring bull market before the bull market in gold and silver ends years from today. It is always a question of investor's perception as to when, if ever, to participate in these markets. However, we expect to fulfill the culmination of our dream within the next 3 years and we frequently recall the words of one of the legendary analyst in the resource sector of "the day when there will be no resources stocks selling for less than $5.00". Yes, we can wait, as we have learned that patience is a required skill in the art of investing. For the investors with their eyes still open, we suggest the accumulation of the junior mining shares while they are still available at these ridiculously low prices. It's your money, it's your choice. Visit our website, www.JuniorMiningResources.com for more information and to sign up for our email list and twitter account. Junior Mining Resources was founded by Dudley Pierce Baker to bring the best junior mining opportunities to the attention of investors through his services. Neither Dudley Pierce Baker, JuniorMiningResources.com, JuniorMiningNews.com, PreciousMetalsWarrants.com nor TheGreedyGuru.com are investment advisors and any reference to specific securities does not constitute a recommendation thereof. The opinions expressed herein are the express personal opinions of Dudley Pierce Baker. Neither the information, nor the opinions expressed should be construed as a solicitation to buy any securities mentioned in this Service. Examples given are only intended to make investors aware of the potential rewards of investing in Warrants. Investors are recommended to obtain the advice of a qualified investment advisor before entering into any transactions involving stocks or warrants.